· Bush agrees to Iraq withdrawal. After nearly six years of summoning America to fight till “victory” in Iraq, President George W. Bush capitulated to the demands of the elected regime the United States had brought to Baghdad for the complete withdrawal of all U.S. troops by 2011. Far from locking in an open-ended U.S. military presence in the Arab heartland as advocates of the invasion had expected, the status of forces agreement became the rallying point for a fractious Iraqi political class—emboldened by an improving security situation—to unite in demanding that the Americans go home. · Cuba opens the door a crack. The Castro family continued to hold the reins in Havana after an incapacitated Fidel’s resignation, but successor Raúl initiated a series of steps to loosen the straitjacket of his brother’s purist communism: permitting Cubans to buy cell phones and computers; issuing private taxi licenses; opening foreign tourist enclaves to Cubans; allowing farmers to buy land and sell produce directly; even eliminating some salary caps. Though security services continued to jail dissenters, Cuba signed the International Covenant on Civil and Political Rights that Fidel had long opposed, prompting the European Union to relax sanctions against Havana and again join this year’s lopsided U.N. majority (185–3) calling for an end to the failed U.S. embargo. · ICC prosecutor targets Sudan president on Darfur. Luis Moreno-Ocampo, chief prosecutor for the International Criminal Court (ICC), threw the U.N. Security Council into turmoil by demanding from the ICC tribunal an arrest warrant against Sudanese president Omar al-Bashir, charging him with ordering genocide—Moreno did not shy away from the word—in the guise of “counterinsurgency.” Echoing longstanding arguments made by U.S. opponents of the ICC, Russia and China warned that an indictment would get in the way of a political deal to “solve” the Darfur crisis; human rights defenders, by contrast, saw the execution of arrest warrants as a big step toward a real solution, one founded on justice. · Iraq accountability gathers steam. Raising hopes among U.S. advocates of the rule of law, the expiring Bush administration found itself under intensifying pressure on multiple fronts regarding widespread alleged illegalities in Iraq and in its treatment of detainees. Federal courts insisted on judicial review of Guantánamo detentions, inspectors-general documented massive waste in the U.S. occupation and willful deception on its failures, the administration’s favored private security force faced indictments for wanton killing of Iraqi civilians and expulsion from the country—and the Senate Armed Services Committee officially traced responsibility for torture directly to top administration officials. · Literacy campaign produces progress. Halfway through the United Nations’ decade-long global effort to conquer illiteracy—of which U.S. First Lady Laura Bush has been a chief patron and honorary ambassador—the U.N. Educational, Scientific and Cultural Organization reported a jump in the global literacy rate from 76 to 84 percent so far this decade. With the largest pools of illiterate adults residing in such high-growth developing economies as Brazil, China, and India, these countries’ redoubled investment in literacy should yield major reductions in the worldwide total of adults disabled by illiteracy, but UNESCO warns that most other developing countries are not on track to meet the Millennium Development Goal of halving every country’s illiteracy rate by 2015. · Lula’s Brazil eclipses Venezuela as lighthouse for the Latin left. Venezuela’s Bush-bashing president Hugo Chávez—beset by electoral setbacks at home and an abrupt crash in the oil revenues that had fueled his patronage of like-minded leaders abroad—continued to lose traction with Latin America’s resurgent democratic left. Brazil’s Lula da Silva, steadier and respected across the ideological spectrum, cemented his position as leader of the Latin left—deftly able to confront conservative Washington without provoking it, even while admitting communist Cuba into the Latin/Caribbean region’s Rio Group. · Multiplying mediators move Middle East peace. As President Bush’s Annapolis “peace process” promising an accord between Israelis and Palestinians by the end of 2008 stalled out, other mediators emerged to facilitate negotiations that he could not—with Egypt and Qatar mediating talks between Israel and Hamas-ruled Gaza (and between Hamas and Palestinian president Mahmoud Abbas’s West Bank-based authority), and Turkey as go-between for Israeli and Syrian negotiations. Though embattled prime minister Ehud Olmert outraged his former allies on the Israeli right by confessing that long-held “messianic dreams” of a greater Israel are unattainable and a return to the 1967 borders essential for Israel’s survival, his lame-duck government’s massive assault on Gaza when a fraying truce expired at year’s end left prospects for peace in 2009 problematical. · Obama election excites worldwide “hope.” The world watched with amazement as American voters defied all expectations to nominate and then elect as president a biracial son of Africa, raised in Muslim Indonesia and pan-Asian Hawaii—symbolically as well as substantively as complete a repudiation as could be imagined of the harsh ideology Americans had accepted with Bush in 2004. The unprecedented 200,000 people who gathered in July to hear the candidate in Berlin evidenced the hopes for change invested in Barack Obama worldwide, as well as a reawakened admiration of America’s ideals, which his post-election commitment to “strengthening international institutions” did not disappoint. · Polio, eliminated from Somalia, is again in retreat. Despite war and political anarchy, Somalis—supported financially by U.N. agencies, governments, and private funders such as Rotary International—succeeded in 2008 in eliminating polio, which had re-entered the country three years ago from northern Nigeria. With new polio infections worldwide having fallen from 350,000 twenty years ago to 1,308 in 2007, the World Health Organization this year targeted Afghanistan and Pakistan as the next countries to be made polio-free, leaving India and Nigeria as the last redoubts of the disease. · Wobbly Pakistan returns generals to the barracks. Despite military ruler Pervez Musharraf’s efforts to cling to power through manipulated elections, Pakistan’s voters swept his loyalists out of parliament and handed power to a democratic coalition that forced the general into retirement. But the Islamabad security establishment—long involved with Islamic extremists in fomenting conflict in both Afghanistan and India—continues to resist control by elected civilians, as do restive tribal regions near Afghanistan, and the fate of Pakistan’s restored democracy remains very much in doubt. · Afghanistan unravels. Hamid Karzai’s beleaguered government in Kabul proved increasingly ineffectual in providing services to its population, or even security in its supposed strongholds, as Taliban insurgents extended their attacks throughout the country. Few European allies seemed to share the emerging Washington political consensus that more Western troops are needed to turn the tide militarily, and Karzai himself helplessly demanded control over high-casualty U.S. air strikes and invited direct talks with the Taliban’s Mullah Omar on an all-Afghan peace settlement. · Climate change negotiations stall. Even as U.N. meteorologists reported another year of rising average temperature and extreme weather, and despite the warning shot of a staggering spike in oil prices, negotiations on a global pact to reverse greenhouse gas emissions failed to make substantive progress, with the Bush administration frozen in continuing denial and newly industrializing countries coy about restricting their fast-growing emissions. With Italy’s Silvio Berlusconi citing the global economic crisis as a reason to block European Union commitments to deep reductions, even the Europeans began backpedaling, approving a climate-change package late in the year that the World Wide Fund for Nature charged would actually lower E.U. carbon emissions just 4 percent—not the promised 20 percent—below 1990 carbon emissions levels. · Congo war drains lives and resources. Hopes that the U.N.-sponsored election in 2006 would lead to Congo’s peaceful reunification evaporated this year, as president Joseph Kabila’s government suffered demoralizing military reversals at the hands of Rwandan-backed rebel forces in eastern provinces and erosion in its authority elsewhere in the country. The Congo war, while drawing far less international attention than Darfur, continued as the world’s deadliest conflict, producing an estimated 5 million fatalities and tying down the U.N.’s largest peacekeeping operation of 19,000 troops at a cost of $1.2 billion a year. · India, Pakistan veer toward confrontation. The progress that South Asia’s two nuclear-armed antagonists had seemed to make toward détente, especially after elected civilians regained office in Pakistan, was reversed late in the year after a Pakistan-based extremist group long tied to Islamabad’s secret security services launched a devastating terrorist attack on Mumbai. U.S. officials, anxious to keep Pakistan’s troops in its western provinces to suppress armed elements aiding Afghanistan’s Taliban, worked feverishly to contain the crisis; by explicitly citing Kashmir as part of the regional puzzle, President-elect Obama raised concerns among Indian officials who have long and successfully strived to keep the state’s status off the international agenda. · Irish block E.U. integration. Ireland’s voters, whose spectacular economic growth has resulted directly from gaining membership in the European Union, in June voted down the Lisbon Treaty, a streamlined version of the draft E.U. constitution that was derailed in 2005. Though Dublin vowed to hold a new referendum in 2009, advocates of the overhaul to free E.U. decision-making from a single member’s veto feared that the continent’s small island outpost may have dashed hopes for a united Europe to become a credible heavyweight on the international stage. · Russia’s estrangement divides the West. Russia—already irate about Bush administration plans to place antimissile facilities in Poland and expand NATO to include the ex-Soviet republics of Ukraine and Georgia—made good on its threat to counter Western recognition of Kosovo’s independence by crushing Georgia’s bid to seize control of South Ossetia and recognizing it and Abkhazia as independent. Washington found ready allies among NATO’s ex-communist member states for rushing Kiev and Tbilisi into the Atlantic alliance, but western Europeans lead by Germany, France, and Italy—all determined to prevent a gratuitous new cold war with Moscow—adamantly opposed extending NATO security guarantees to the two seemingly unready and politically divided states. · Somalia breakdown spawns pirate swarms. Somalia’s bickering “transitional government” was poised to transit out of Mogadishu by year’s end as the Ethiopian troops that the Bush administration had recruited two years earlier to battle Islamist factions proved unable to control their resurgence. Unchecked by any government authority, Somali seafarers revived the ancient practice of piracy, hijacking freighters for ransom and imperiling shipping through the Red Sea; and the U.N. Security Council’s call for naval forces to suppress the pirates afforded China’s modernizing navy the chance to make its international debut. · U.S. leads world economy over the brink. The free-market “pirates” who had hijacked the U.S. political-financial complex and infected financial institutions worldwide with their unregulated toxic securities sought government rescue as their house of cards collapsed, dragging one pillar of the U.S. economy after another into the black hole of a global financial meltdown. Spurning the Washington orthodoxy imposed on other troubled economies in recent decades, American authorities spent freely on serial bailouts hoping to free up credit, prop up demand, and avert a second Great Depression—leaving America’s yawning financial and trade imbalances with East Asia (and consequent power realignments) to the incoming Obama administration to sort out. · Vise tightens on Zimbabwe. The desperate economic conditions caused by the aging Robert Mugabe’s implacable land expropriations led to his defeat in the first round of Zimbabwe’s presidential election, but he clung to power through a wave of terror unleashed by loyalist goons. While a number of African countries finally broke with the one-time liberation hero, South Africa led a Security Council bloc that rebuffed Western eagerness to intervene—but South Africa’s own much touted “quiet diplomacy” proved utterly incapable of persuading Mugabe to share power with the elected opposition, as by year’s end a cholera epidemic delivered nature’s own harsh verdict on his sclerotic regime. BANGKOK, Dec. 30 — Thailand’s new prime minister used his delayed maiden policy speech to lawmakers Tuesday to warn that the stalled economy is unlikely to recover as long as the country is held hostage by political conflict. But the challenges facing Abhisit Vejjajiva’s administration were thrown into stark relief when thousands of his opponents surrounded parliament, forcing him to deliver his speech in the Foreign Ministry. “Political conflicts that have spread to civic groups could push the economy, along with the tourism industry, into recession if action is not taken quickly to resolve them and revive confidence among investors and foreign tourists,” Abhisit said. “These conflicts are the country’s weakness, especially at a time the world economy is entering its worst crisis in a century,” he said. The Oxford-educated Abhisit is Thailand’s third prime minister in four months. He came to power after his Democrat Party managed to persuade enough members of the previous ruling coalition to defect when their leader, former prime minister Somchai Wongsawat, was banned from holding office because a court had found his party guilty of vote buying. But supporters of Somchai and his political sponsor, former prime minister Thaksin Shinawatra, question the legitimacy of the new government and have vowed to continue demonstrating until Abhisit dissolves parliament and calls fresh elections. For most of this year, the deep divisions between the country’s conservative middle-class elites and its rural poor paralyzed the ability of Abhisit’s predecessors to govern a country sliding into an economic quagmire. Many had hoped that Abhisit, who is more acceptable to the yellow-shirted protesters who have caused so much disruption in recent months, might be able to take the country forward. However, his appointment appears to have galvanized the opposition of a different group, which favors red shirts. Abhisit’s opponents said Tuesday they might challenge the constitutional legality of his giving a speech outside parliament, as he did Tuesday under pressure from protesters. Thailand relies on exports and tourism for about 70 percent of its national income. Its economy is being squeezed by the twin threats of the global slowdown, which has slashed demand for its main exports, and the damage done to investor confidence by the past six months of domestic political unrest, culminating in the closure last month of the country’s two busiest airports. The Bank of Thailand said Tuesday that it expects the economy to contract by 2.5 percent in the fourth quarter compared with the third quarter, in part a reflection of a 17 percent drop in exports in November. 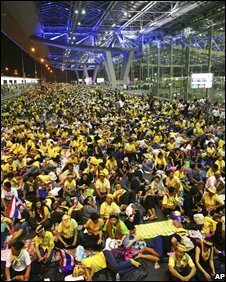 The six months of virtual political paralysis that preceded the airport closures prevented successive governments from implementing any effective program to counter the slowdown, exacerbating the problems that Abhisit now faces. The new prime minister is expected to launch an ambitious $8.7 billion stimulus program to try and restart the stalled economy. He warned Tuesday that unless the government is able to take prompt action, the official unemployment rate could double. However, analysts say that given Thailand’s large informal labor sector, the fallout from the crisis could actually be much worse than that. Dec. 31 (Bloomberg) — Khaleda Zia, whose Bangladesh Nationalist Party was defeated by a landslide in national elections this week, said the ballot was rigged, the Daily Star newspaper reported. “By declaring pre-set results, the Election Commission has shown the polls did not reflect public opinion,” the English- language daily cited Zia as telling reporters early today. There has never been such an instance of such a “massive ballot rigging,” she said. The Dec. 29 vote, the first national election in Bangladesh since 2001, was won by a political alliance headed by former Prime Minister Sheikh Hasina Wajed’s Awami League. The alliance won 262 seats in the 300-member parliament, while the BNP and its allies won 32, the Star reported. Zia, also a former premier, and Hasina have dominated Bangladeshi politics for the past decade and rivalry between their supporters led to street fighting, strikes and transport blockades that prompted an army-backed interim government to declare a state of emergency two years ago. Analysts say the country of more than 150 million people could see renewed political violence if the BNP refuses to accept the result. Former Bangladesh Prime Minister Khaleda Zia, defeated in Monday’s parliamentary elections, has rejected the results saying the vote was rigged. ..
Rwanda: UN-backed war crimes court sentences for genocide. Former Rwandan Army Col. Theoneste Bagosora, right, arrived with his co-defendant Col. Anatole Nsengiyumva at the International Criminal Tribunal for Rwanda on Thursday in Arusha, Tanzania.